Welcome to my blog. Today, I'm participating in the Denami Valentine Blog Hop. I'm so excited to be able to participate again. I've been quite busy moving into my new house, but things are settling down now. This is the first card I made in my new craft room! 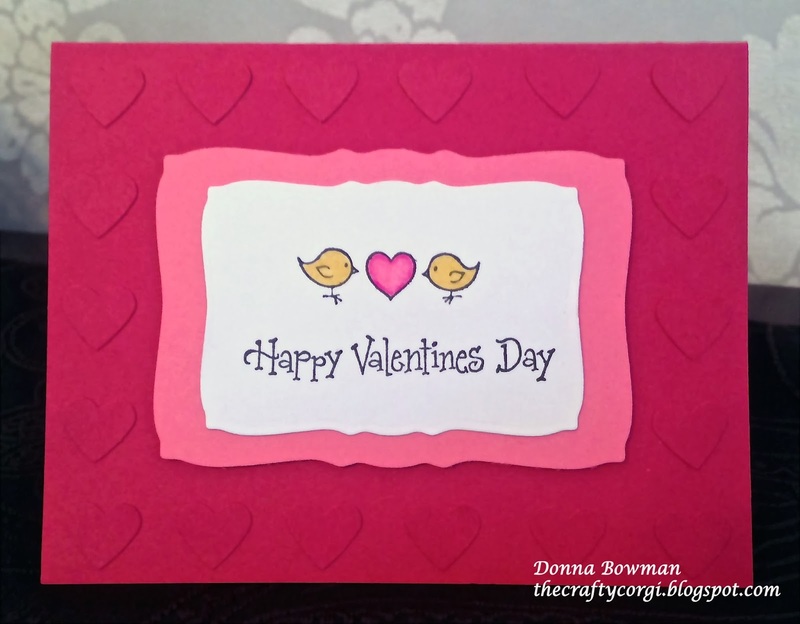 I love Denami Stamps and I thought this Valentine Birds stamp was just too cute. For this card I colored in the images and with Prismacolor Pencils and blended with Gamsol. I punched some little hearts in the dark pink color to make a background. The papers are all from Stampin' Up. The dies are are Sizzix Framelits and the ink is Memento. If you're following the hop you should've come here from the blog of the super talented Greta at http://ggnursecreations.blogspot.com/ and your next stop will be the blog of the very gifted Dana at http://kismetartlife.blogspot.com/ If you just found out about the hop and want to start at the beginning go to the Denami Blog. Adorable - perfect Valentine's Day card - love the chicks! Super adorable! A darling CAS card. Perfect CAS design! I love the focal panel...awesome! Super sweet and simple but a perfect, precious valentine!! So cute, Donna! And how excting that it was made in your NEW house!!!!! Donna I love the raised heart BG on your card! And the simple and sweet bird love stamp looks great colored with prismacolors and gamsol. WOW. This card is an adorable valentine! Great work! Lovely CAS card, Donna! I love the tones of pink and the punched hearts. At first I thought it was an embossed background....love your idea instead to use punched hearts!! Cute, cute card and hope you have many wonderful memories in your new home! Darling, sweet and adorable! Your little chickies sharing some love...heart-melting! Donna, your chickies are so cute with their heart adding some love! So sweet, simple, and utterly darling! I love your CAS Valentine, Donna! This reminds me of cards we used to make...love it! Very sweet card. I love those embossed hearts. Sweet card with the little love birds! Love your background with the embossed hearts. so sweet and simple! LOVE those little birds! Donna this is perfectly sweet! A cute CAS design! Very sweet--I like the heart background. Cute card. I love the punched hearts. Cute card and love the punched heart background. I love the layers and the little mini hearts. I am so in love with the chickies! Super cute - love the little birds. I like how the card is so simple, but yet so darn cute! thanks! Your little chicks are so precious. Love the simple and pretty red heart background for it. Sweet CAS design! The embossed background really make your design pop! Gorgeous Donna, the heart background is perfect! ADORABLE!!! Love those sweet little chickies and the punched hearts in the background!!! يقوم العمال ببخ المبيدات علي الرضيات و علي الحوائط , و يقوم مجموعة العمل بصنع ثقوب صغيره للغاية و علي مسافات متباينه في الارضيات و يقوم الفريق باستعمال اجهزه احقن لوضع المبيدات اسفل الارضيات و وراء الحوائط للوصول الي مستعمرات النمل و التخلص منها على نحو ختامي , و أيضا يتم عمل ثقوب بداخل الاخشاب لوضع المبيدات بداخلها ( و تهتم الشركه بان تكون هذه الثقوب صغيره للغاية بحيث لا تبدو للعين الأمر الذي يجعلها تقوم بتخريب هيئة خارجية البيت).